q: what is sweet and wistful, filled with rich colors, awakens vivid memories of childhood daydreaming and wonder, and feels warm but just a tad lonely too? a: the marvelous work of prize winning barcelona artist, album and book illustrator riki blanco. i can’t decide which one i like best – maybe the whale with the bather on the top? get these prints while they’re hot at thumbtack press. check out amazon to purchase the children’s literature. and you absolutely must (must!) check his whimsical website out too! The dog with the phonograph is my favorite. the doggie one is VERY funny. I love them all! I think the sea captain, or the boy in bed are my favorites. They are all so lovely though, thanks for showing these beautiful pieces of art! I like how abstract the pictures are… very nice find :). Love it! yes! i like the abstract ideas combined with the more representational figures in each piece. they really make my mind go! like them all. such Great fun! and in 2008 wishes for you: love, gratitude, happiness and fulfillment surround you!!! i am glad you like them too! i just love riki’s style. These are so much fun! 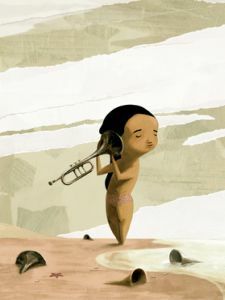 The dog and phonograph made me laugh out loud, but I think I like the kid with the trumpet on the beach the most. They are all so whimsical. I see the sand hint too. Maybe a little wistful? that trumpet kid. i think i must have it – and the whale. love that whimsy!